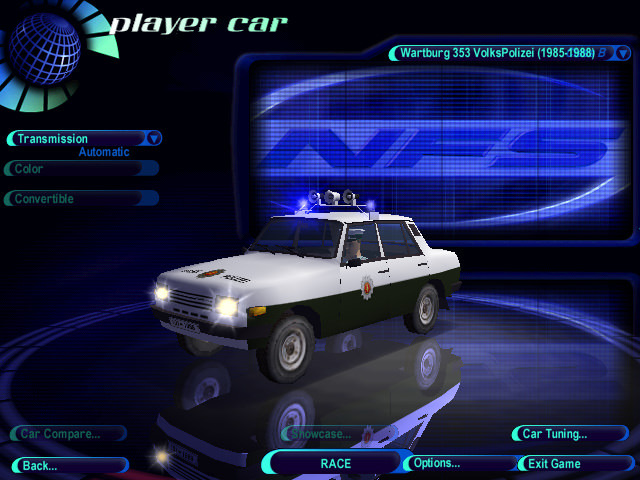 This is a 1985-1988 Wartburg 353 VolksVerkehrsPolizei (DDR Traffic Police) patrol car, Part of the NFS HighStakes ColdWar Mod. This car was used up til about 1991 (although it was repainted standard polizei green/white in 1990 and the VolksPolizei emblems removed (those versions coming soon). Special thanks to: Team Nitro (the car it's self which is converted from Midtown Madness 2 format) Torsten Belger (a pic I saw the car in and used for reference) Racing Freak (helping with stuff) Former DDR citizens and officials I've met over the years online (very helpful and encourage my making these classic vehicles to continue on :) Emergency 4 DDR Mod Team (F.E.R. lights and lightbar) FrankNFurter (parts used) Staff at NFS Police H.Q.